Chris P Tee Magic Parties are Exclusive and Unique, making me one of the most Popular Children's Magician's in the UK. 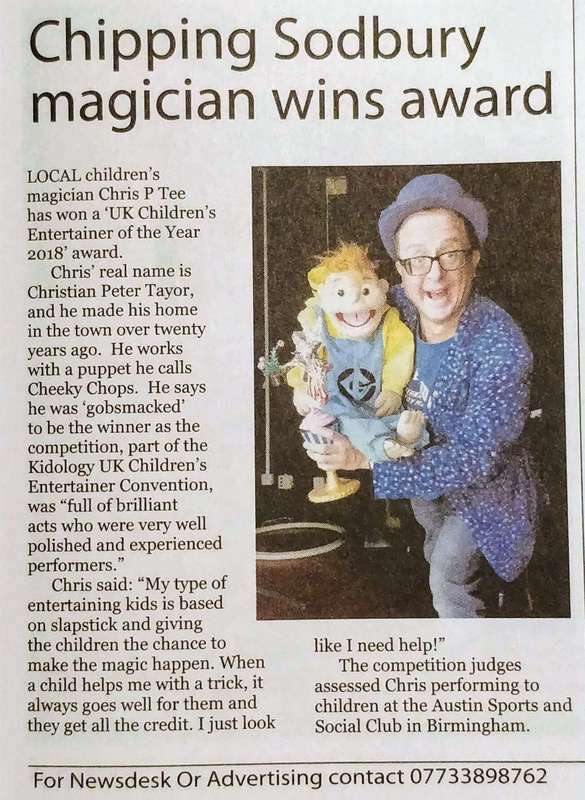 ​Kidology UK Children's Entertainer of the Year 2018. Your Child's Party is Guaranteed to be Fun with Happy Memories that'll last a Lifetime. I will help you make it memorable for ALL the right reasons. As a Bonus, you will love every minute of it too. Make your Children's Parties and Family Events Interactive, Magical and Memorable. with Chris P Tee and Cheeky Chops. You bring the Food, I bring the Fun. "Just Leave it to me, Chris P Tee"
Puppets, Music, Lights and Dancing. You don't need to do a thing, just follow my lead. This is Your Party, Your Way. Including my Kid's Magic Show, Puppets, Music, Lights and Dancing. BIG Sound for Family Gatherings, Christenings, Weddings etc. I am the Compere and You are the Organiser. Available 7 days a week, All over the South West and as Far as London. On Map, Blue is my Local, 30min Area Rate, Red, Purple and Outside Areas are Extra. I do Travel Further, Just Ask. I do travel further, please call for an accurate price. Small Budget, Low Income? No Problem, not everyone can afford great entertainment. Call me and let's see what we can do. You never know until you ask. I concentrate on making Your Child the Star of the Show and Making You the Happiest Parent Alive. Seriously, your child's special day is as important to me as it is to you. Call me for help, advice and the best party you've ever had. Chris P Tee will make the Party AMAZING for your Birthday Child, Fun for Their Friends, Amusing for the Parents, Easy for You! ​It's Your Child's very special day and becomes the Star of the Party and the Show. Making the Magic Work by Waving the Wand & Saying the Magic Words "Leave it to Me, Chris P Tee"
Each show is different, even though many of the tricks have been performed before, it's the children that make the show Amazing. ​I play to my audience and most importantly, to Your Child so they remember being The Magician's Apprentice. Great Value Entertainment and a Memory to be treasured. *A Professional, Kid's Comedy Magic Show and Mini Disco"
You can have the Magic Show all on it's own, or book a Mini Disco too, it's up to you. ​Fee's Depend on Location, Time of Day and Duration of Show. CONTACT ME for an Accurate Quote and to Check I'm available.